The world’s biggest floating solar power plant is up and running in China, as the country increasingly looks to renewable sources for its energy. It comes at a time when Beijing is expected to take a bigger role in global efforts to tackle climate change, after the United States pulled out of the landmark 195-nation Paris deal. The new solar farm in the city of Huainan, in the central, coal-rich Anhui province, can generate 40 megawatts of electricity – enough to power 15,000 homes. That’s according to Sungrow Power Supply, the Chinese firm that built the plant. It was connected to the city’s power grid in May. The solar farm occupies an area that for years saw intensive coal mining. Subsidence and heavy rain created the lake where the solar panels have been installed. Those panels float on the surface of the water, which ranges in depth from four to 10 metres.While Sungrow did not disclose the exact size of the plant, its capacity is double that of the solar farm previously considered the world’s biggest. That plant is also located in Huainan and was built by Xinyi Solar in 2016. With US out of Paris climate deal, China’s now able to lead … but is it willing?Earlier in 2016, a floating solar farm began operating on the outskirts of London with capacity to generate just over 6 megawatts of electricity – it was considered the biggest at the time, according to a report in The Guardian. Floating solar farms take advantage of areas that would otherwise go unused and the water helps to cool the surface of the panels, reducing the risk of overheating. China is now the largest solar energy producer in the world – its capacity reached 77.42 gigawatts at the end of last year, according to the National Energy Administration. Renewables make up 11 per cent of the country’s energy use, but that number could go up to 20 per cent by 2030. Earlier this year, the world’s biggest solar farm was unveiled in a remote part of the Tibetan plateau, in western Qinghai province. The sprawling Longyangxia Dam Solar Park covers some 27 square kilometres – almost the size of Macau. It can generate enough power to supply 200,000 homes. Other large-scale solar projects in the country include the installation of 300 panels above a fish farm in Zhejiang province and a 6-million panel solar farm in the Ningxia autonomous region, which will be the biggest when it is completed. Chinese companies are also involved in solar projects in other countries. State-owned National Complete Engineering Corporation is working with GCL System Integration Technology to build a 1-gigawatt solar plant in the exclusion zone around the Chernobyl reactor – the site of the worse nuclear accident in history. China’s embrace of renewable energy presents a stark contrast to the climate policies of the United States, which has announced it will exit the landmark Paris climate agreement. US President Donald Trump has slammed his predecessor Barack Obama for “wasting” taxpayer money on solar companies, called wind farms both “disgusting looking” and “bad for people’s health”, and proposed an administrative budget that would slash renewable energy spending by 70 per cent. China and India signed 26 business deals worth more than $22 billion in areas including renewable energy, ports, financing and industrial parks, an Indian embassy official said on Saturday. Namgya C. Khampa, of the Indian Embassy in Beijing, made the remarks at the end of a three-day visit by Indian Prime Minister Narendra Modi, during which he sought to boost economic ties and quell anxiety over a border dispute between the neighbors. “The agreements have a bilateral commercial engagement in sectors like renewable energy, industrial parks, power, steel, logistics finance and media and entertainment,” Khampa said. 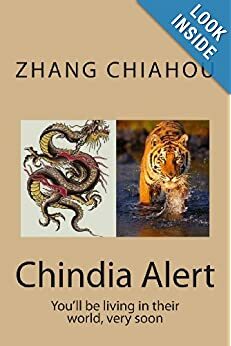 At the same event, Modi encouraged Chinese companies to embrace opportunities in India in manufacturing, processing and infrastructure, announcing “now India is ready for business” with an improved regulatory environment. “You are the ‘factory of the world’ whereas we are the ‘back office of the world’,” Modi said. via China, India sign more than $22 billion in deals: Indian embassy | Reuters. Prime Minister Narendra Modi on Sunday called for innovation and research to develop renewable energy to provide affordable electricity to every household. Inaugurating the first Renewable Energy Global Investors Meet (RE-Invest), Mr. Modi called for collaboration between the 50 nations with abundant solar power to develop technological solutions. He said the cost of electricity from solar photovoltaic cells has come down from Rs. 20 per unit to Rs. 7.50 and research and innovation can help bring it down further. Hybrid power generation involving solar and wind energy should be encouraged as it will help save on transmission and power evacuation infrastructure cost, he said. Mr. Modi also called for developing domestic manufacturing of renewable energy equipment to create jobs. Conserving energy, he said, is the need of the hour. via Modi calls for innovation in renewable energy – The Hindu. India could start installing 20,000 megawatts of solar power capacity as early as April after companies pledged to support the government’s drive for clean energy, an official told Reuters. Details of the plan, which has drawn commitments from U.S., German and Chinese companies, will be announced on Friday, said Upendra Tripathy, secretary of the Ministry of New and Renewable Energy. “We have got commitments from very established industry, both foreign and domestic for next year,” he said in an interview at his office. Foreign companies will be allowed to decide where they manufacture the required equipment, he said. via Companies set to back huge India solar expansion | Reuters. “We used to have around 300 coal mines in the area. Now it’s down to 70-plus,” said a manager of a local pit who identified himself only as Mr. Cheng. Shrinking profit margins and a failure to meet safety standards have led many to close, Mr. Cheng said. His own midsize company, Kanghe Coal Mining Co., was swallowed by a larger competitor, state-owned Kailuan Group Co., last year. What is happening in Yu County is an illustration of the bleak times for the global coal industry. Tougher environmental standards coupled with shrinking demand have led to the closing of mines across China and sent coal prices to their lowest in six years. China’s coal output likely fell 2.5% in 2014, the first annual decline in 14 years, the China Coal Industry Association said last week. And while full-year data aren’t yet available, official statistics show China consumed 1.1% less coal in the first three quarters of 2014 than a year earlier. 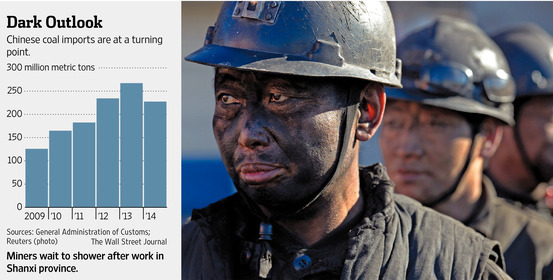 via Mines Shut as China Burns Less Coal – China Real Time Report – WSJ. India said its pollution levels will need to increase in the years ahead to support its economic development and it won’t discuss limiting greenhouse-gas emissions at United Nations climate talks that began this week. Environment Minister Prakash Javadekar also said the government is preparing to make a pledge on how India will develop cleaner forms of energy, though he stopped short of indicating when the country might take on the sorts of caps for emissions that the U.S., China and Europe are adopting. The comments indicate the difficulty in bringing all of the 190 nations gathered at the UN climate talks in Peru this week into a deal that will cut back on the pollution blamed for driving up the Earth’s temperature. While India’s emissions are the third-highest in the world, 30 percent of its residents live in poverty, scraping by on 75 cents a day or less. Javadekar spoke before departing for the UN talks in Lima, Peru, which run through next week. They’re aiming to put together the building blocks for a deal by the end of next year that would cut pollution in all nations from 2020. India is under pressure to make its environmental goals more clear after China and the U.S. jointly agreed Nov. 12 to rein in fossil fuel emissions. It was the first time a big developing country said it would take on a mandatory limit on pollution. via India Says Pollution Levels Need to Rise Further to Boost Growth – Businessweek. India said Friday it was optimistic the world would reach an agreement to curb climate change, but said its actions would be focused on boosting its renewable power capacity five-fold rather than on cutting carbon emissions. With hundreds of millions still mired in poverty and without access to electricity, India cannot afford to reduce greenhouse gas emissions at the expense of economic growth, Environment Minister Prakash Javadekar said before leaving this weekend for U.N. climate talks in Lima, Peru. He said he was optimistic industrialized nations would agree to shoulder more of the burden to reduce greenhouse gas emissions, given that they had been polluting with fossil fuels for decades before developing nations. “That is the just regime,” he said. The recent U.S.-China pact announcing new targets for fossil fuel use marked a positive step toward establishing this sort of equality, he said. In that pact, the U.S. said it would aim to bring down its per-capita emissions from about 20 tons while allowing China to raise its 8-9 tons per capita so that both reach a level of about 12 tons by 2030. “They have accepted the differentiated responsibility and the need of time for growth,” Javadekar said. India had already pledged to reduce its emissions intensity — how much carbon dioxide it produces divided by its GDP — rather than promising to cut overall emissions. However, Indian officials and scientists say it could easily go beyond the target set in 2009 of cutting emissions intensity by 20-25 percent below 2005 levels by 2020. India’s preference for the per-capita emissions calculation also ignores the fact that around 400 million Indians still have no access to electricity at all, while hundreds of millions more are lucky to get a couple of hours a day. Experts worry that as India’s population continues to grow beyond 1.2 billion and more people become wealthy, its share of global emissions will skyrocket. via India plans 5-fold increase in clean energy – Businessweek. China will boost oil exploration, use less coal and more natural gas, build more nuclear plants and develop renewable energy under a new seven-year development plan. The State Council’s newly released plans for 2014-2020 marks the latest attempt by policymakers to limit the nation’s appetite for energy. 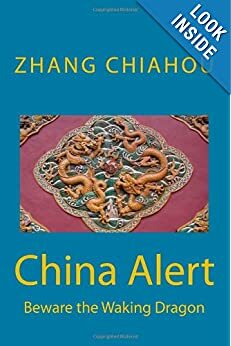 Reflecting its rapid industrialisation and economic growth, China has become a voracious consumer of energy, changing global energy markets and the geopolitics of energy security. The document sets out five strategic tasks for the nation’s energy development. The first is to achieve greater energy independence by promoting clean and efficient use of coal, increasing domestic oil production, and developing renewable energy . China plans to develop new and existing oilfields in nine regions where it has large proven reserves – including in the northwestern, central and northeastern provinces as well as offshore fields in the Bohai Gulf and the East and South China seas. The plan also calls for boosting offshore oil exploration though improved exploration trace analysis, promoting deep-sea bidding from foreign corporations to develop offshore sites and greater research and development in deep-sea oil discovery technology and equipment. The plan’s second task is to curb excessive energy consumption and implement energy-efficiency programmes in urban and rural areas. The third task builds on this goal by cutting the proportion of coal used in the nation’s energy production while using more natural gas, nuclear power and renewable energy. The plan calls for more nuclear plants to be built along the coast “at a suitable time” while also studying the feasibility of inland nuclear plants. The fourth task is to expand international cooperation in energy, establish regional markets and participate in global energy governance. The fifth is to promote innovation in energy-related technology. via More nuclear plants and renewable energy under new development plan | South China Morning Post.